We are continuing our poor start. According to the Department of Labor, Bureau of Labor Statistics (BLS) the CPI-W dropped 0.1% in November from what it was in October. 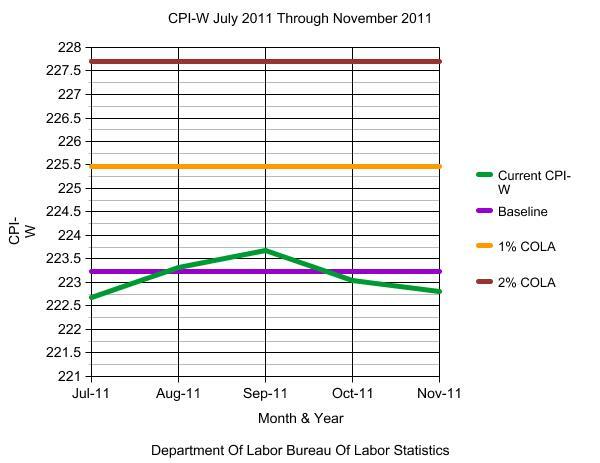 To remind everyone, the October CPI-W dropped from September. The energy index declined for the second month in a row and offset increases in the indexes for food and all items less food and energy. As in October, the gasoline index fell sharply and the index for household energy declined as well. The food index rose slightly in November, though the index for food at home declined as four of the six major grocery store food group indexes fell. The index for all items less food and energy increased 0.2 percent in November following increases of 0.1 percent in each of the prior two months. The indexes for shelter, medical care, apparel, and personal care all rose. These increases more than offset declines in the indexes for new vehicles and used cars and trucks. I would say that it has gone up a hell of a lot more than that while incomes have dropped significantly. This is based on the figures from the Labor Department. The government has a variety of reasons to understate inflation. I agree with you that the actual amount of inflation seems to be considerably higher than the “official” numbers that the government foists on us. You are referring to the the CPI-E, which, according to the Department of Labor is still experimental. Bills have been introduced into Congress to switch from the CPI-W to the CPI-E as the basis for COLA computations, but they have gone nowhere. Now I want to make something very, VERY clear. UNDOCUMENTED ALIENS DO NOT QUALIFY FOR SOCIAL SECURITY. THEY DO NOT QUALIFY FOR SSI, OR MEDICARE, OR MEDICAID, OR FOOD STAMPS, OR HUD HOUSING SUBSIDY, OR ANY OTHER AID OR BENEFIT PROGRAM WHOLLY OR PARTIALLY FUNDED BY THE FEDERAL GOVERNMENT. I doubt that even a single state pays any sort of cash benefits to undocumented aliens. THIS IS A REPUBLICAN MEME, A BIG LIE, AND THEY CONSTANTLY REPEAT IT TO DISCREDIT SOCIAL SPENDING, TO WHICH THEY ARE PHILOSOPHICALLY OPPOSED. When someone unthinkingly repeats this they are strengthening the Republican Big Lie. I usually do not put up comments from people who include this Big Lie in their comment, because I do not want to contribute in any way to spreading it. I will not comment on this issue again, nor will I put up any comments which include it. I’d rather not. He was a homely little troll. I know you don’t approve of my using his quote about “The Big Lie” but basically I don’t care. It is an exact description of the Republican messaging technique. My personal favorite (?) lately is that if the taxes of rich people are raised or subjected to a surcharge, this is somehow a “job destroying” action. This is their personal taxes, from their 1040s, which taxes the net income to them from their businesses or corporations or partnerships or plain old jobs. The job creation goes on in the businesses or corporations or partnerships, etc,. The only conceivable jobs that could be affected are those people employed by the rich as servants, nannies, gardener, and the like, and I serious doubt that any rich parasite is going to fire his pamperers just because his taxes are raised. However, then next time you deign to comment on this blog, you will either do so politely, with a reasoned argument, or else your comment will be rejected as spam, as this one should probably have been.